Report: How do the large research nations compare? A nation with a strong research base will not only benefit from the progress spurred by cutting-edge research; it will develop a new generation of researchers and draw researchers from abroad, further strengthening its ability to drive innovation and economic development. United States. The US is leading in absolute value across the board but is losing share: R&D expenditure, citation share, field-weighted citation impact (FWCI) and highly-cited article share are all decreasing. Germany. In Germany, research is driving world innovation. Germany has the greatest relative share of worldwide patents referencing its research than that of any other large research nation. France. France is the most internationally collaborative country among the large research nations with 50% of its share of articles being co-authored internationally. China. China is heating up the "science race," and the research base is growing fast. Article share is up as is citation impact, implying that quality is also on the rise. 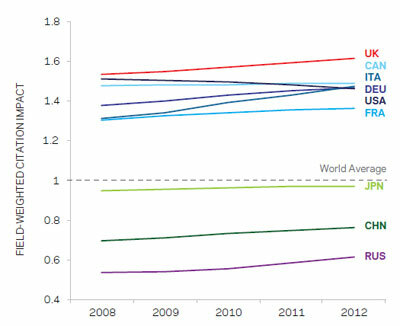 In addition, R&D expenditure and share of global patents is up. This is why many nations are eager to invest in scientific research. But to find the best investment strategy, they need a detailed understanding of their research strengths and weaknesses. In the UK, the Department for Business, Innovation & Skills (BIS), charged with supporting economic growth, monitors the nation's research output closely. To understand how the UK compares with other nations in the research arena, BIS works with Elsevier's SciVal Analytics team. Their most recent collaboration was a 120-page report titled International Comparative Performance of the UK Research Base 2013, which was released last week. The report assesses the performance of the UK research base compared with seven other research-intensive countries (Canada, China, France, Germany, Italy, Japan and the US), three fast-growing nations (Brazil, India and Russia) and other international benchmarks. The report follows a major benchmarking study SciVal undertook for BIS in 2011. Back then, the data suggested that although the UK was a major player on the world's research stage, holding on to that position might be tricky. So this report came as good news. According to the report, the UK remains a global research heavyweight. The report shows that while the UK represents just 0.9% of the global population, it accounts for 3.2% of R&D expenditure, 4.1% of researchers, 6.4% of research articles, 9.5% of research article downloads and 15.9% of the world's most highly-cited articles. 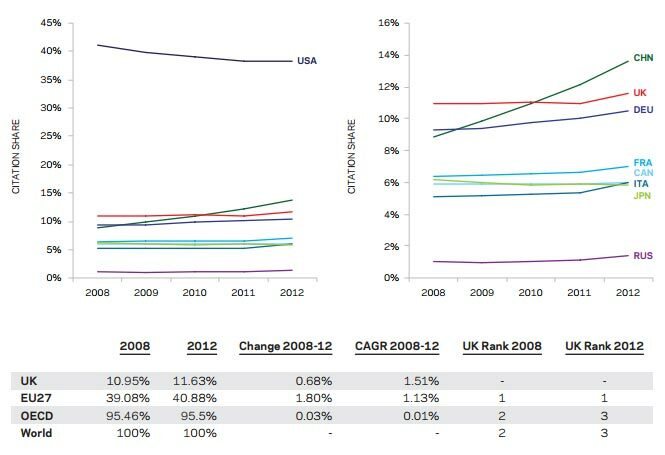 In terms of research quality, as measured by field-weighted citation impact, the UK has overtaken the US and now ranks first among the comparator countries used in the report. These include the world's most research-intensive nations — the US, China, Japan, Germany, Italy, Canada and France. The UK is the most productive research nation in terms of articles and citations per unit R&D expenditure, ranking first among comparator countries on these two indicators. UK research also clearly drives global innovation; its research is the second most frequently cited in global patents in relative terms after Germany. The report shows that by volume of articles published, the UK is a well-rounded research nation. Compared to 10 years ago, and relative to the world average, the UK has increased its emphasis on social science and business but has produced proportionally fewer articles in biological, environmental and physical sciences, mathematics and engineering. Several of the comparator countries, including China, Japan and Russia, focus more strongly on those areas than the UK. The UK occupies a central position in global networks of collaboration. Among its comparator countries, it has the second-highest rate of international co-authorship, after France, and this rate continues to rise. The countries international co-authorship is also associated with high publication impact. Although the nation's researcher count is broadly stable, the report reveals underlying increases in researcher numbers in higher education and a high degree of international mobility among active researchers, meaning the UK researcher population is constantly refreshing. In addition, the UK is the fourth largest producer of PhD graduates globally. "We hope the metrics we have generated using SciVal's big data technology, and the insights that our SciVal Analytics team have drawn for BIS, will provide a useful and objective basis upon which to formulate future UK research policy," said Nick Fowler, Managing Director of Academic and Government Institutional Markets for Elsevier. Elsevier's SciVal Analytics team creates analytical reports for academic institutions, government agencies and corporations worldwide, helping them make decisions about research management, funding allocation, research policies and strategy. Their research experts work closely with clients to tailor the reports, using tools from Elsevier's SciVal suite to analyze data from Elsevier's sources (publication and citation data from Scopus and articles from ScienceDirect); macroeconomic data (e.g., from OECD) and the institution's own sources. The SciVal Analytics team is led by M'hamed El Aisati, Director of SciVal Content & Analytics for Elsevier's Academic & Government Markets group. Team members are Dr. Judith Kamalski, Manager of Strategic Research for Academic & Government Markets; Dr. Andrew Plume, Director of Scientometrics & Market Analysis Global Research & Academic Relations; Jeroen Baas, Product Manager for Academic & Government Markets; and Sue Wilkinson, Director of UK Academic & Government Alliances. 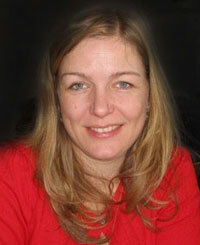 Iris Kisjes (@Kisjes) has worked at Elsevier for seven years, the past four in communications. She is currently Senior Corporate Relations Manager, based in Amsterdam. She has a keen interest in the knowledge economy, especially in relation to the valorization of science and the longevity of the higher education system. Dear Iris, this is wonderful. Is there any direct report on China? Thank you very much in advance. Dear Charley, I'm very pleased you value the report. There is not a specific report that focuses on China, though I will be happy to share the graphics with you that relate to China specifically by email. Hopefully that will be of interest to you. Best wishes.